Senate President Thomas V. Mike Miller choked up before making the announcement in the Senate chamber, as some of his top aides from over the years watched from the gallery. ANNAPOLIS, Md. 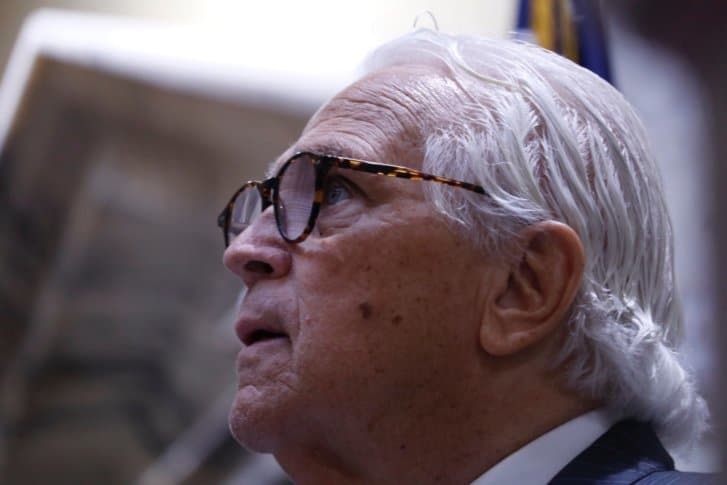 (AP) — Maryland’s longtime Senate president said Thursday he plans to carry out his Senate responsibilities as he fights prostate cancer and undergoes chemotherapy during the state’s legislative session. Senate President Thomas V. Mike Miller choked up before making the announcement in the Senate chamber, as some of his top aides from over the years watched from the gallery. The 76-year-old Democrat is entering his 33rd year as president of the Maryland Senate. He’s the longest-serving state Senate president ever in Maryland and in the nation. “With your continued support and indulgence, I fully intend to fight this disease as so many have and to fully carry out my Senate responsibilities,” Miller said in a statement released as he addressed his colleagues on the second day of the state’s 90-day session. Miller made clear he’d work as long as his health would allow. “The issue should not be about me — the Senate should not be about me — it should be about the Senate and the great work we’re going to do,” he said. In the statement, Miller said he been experiencing significant back pain after hip and knee replacement surgery “that never seemed to heal appropriately.” He was diagnosed in July with prostate cancer and prescribed medication and physical therapy. As he introduced the Catholic priest who offered a prayer before the start of the session, Miller’s voice shook with emotion.“As you can see I’m not off to a good start”, he said with a small chuckle. Senators walked up to hug their longtime leader after Thursday’s session adjourned. “It’s just a sad day for us, but as I’ve said we have to keep it together for the Senate’s sake and that’s what our president wants us to do, and we will just move on forward and do the best job we can and we all have to work together to make that happen,” said Sen. Kathy Klausmeier, who as Senate President Pro Tem will lead the chamber if Miller is absent. Sen. Addie Eckardt, an Eastern Shore Republican, said senators will rally around the longtime Senate chief. “It’s very scary when your leaders are more vulnerable than they have been in the past, but I think it’s a great opportunity for leadership to rally around him and support him,” Eckardt said. Outpourings of support have come from both sides of the aisle. “My heart goes out to President Miller on what I know must be one of the toughest days he’s faced. I know firsthand how hard it is to receive a diagnosis like this. But I also know firsthand that Mike Miller has earned his place in Maryland political history because he’s a fighter who always gives it everything he’s got, no matter how tough things get. Mike’s tenacity, bravery, and perseverance will ensure that he wins this battle, and he has my full support. Miller isn’t alone among top Maryland leaders with health concerns in recent years. House Speaker Michael Busch, 72, had bypass surgery last year and a liver transplant the year before. Gov. Larry Hogan, 62, was diagnosed with B-cell non-Hodgkin lymphoma in 2015. The governor announced he was in remission in November 2016.